French Food is considered one of the finest in the world. That is mainly due to the passion French have for most things, be it love, culture or food. From basic rustic peasant recipes to the more complex cuisine, french culinary is rich and refined. 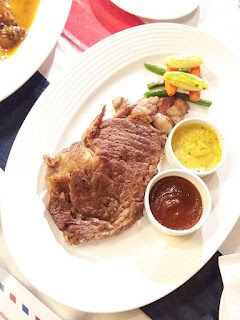 I recently had the pleasure of trying some fine French dishes at a French food festival in ASIA LIVE, Avari Karachi which will be go on till the end of July 2016. From intense to interesting, the food I tasted was definitely something to talk about. We do get good French Food options in many famous eateries in Pakistan but still have no place completely dedicated to it. ASIA LIVE at Avari Karachi is planning to celebrate two weeks of French Food and let's hope they stick to it. They will be focusing different global cuisines every month. Why French in July? It was apt because the French celebrated Bastille Day on July 14th (French National Day). You can read more about it HERE. Even though I arrived later than the invited time, I was still one of the earliest, that's Karachi for you, no one is ever on time, sigh. As we settled down we were presented with a welcome peach drink and the menu for review. I am sure the drink was not french, at least we were not told that it was, neither was it on the menu, but it was refreshing nonetheless. The menu was quite intriguing which elevated the anticipation to taste it further. Before I start talking about my food experience I would like to share that most of the main ingredients; the refined olive oil, meat, snails, duck were imported from France. I took one sniff of the olive oil and my mind was in a sate of serenity. The evening started off with appetizers and salad. We were served with Sauteed Escargots and mushrooms, Liver Pate and Nicoise Salad. The portions were appropriate in quantity as they should be compared to the full plates we get in Pakistan. Appetizers are meant to be bite size or small in quantity for you to warm up before the main course, we still fail to understand that theory but the French know it well. 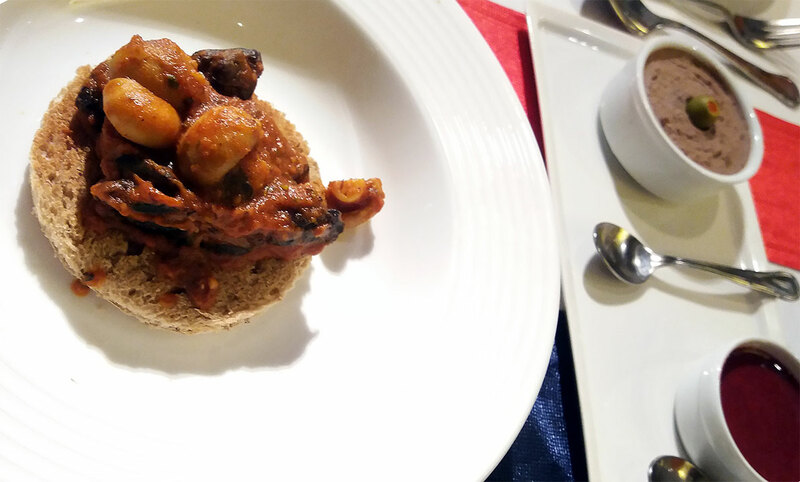 Sauteed Escargots and Mushrooms were served on a toasted Rye bread. Escargots is a french word for snails, especially when eaten in a dish. They are definitely one of the quintessential french dishes out there. Escargots are considered to be one of the classiest appetizers as. This was not my first time eating escargots but it was definitely an experience all over again. The escargots and mushrooms were lightly sauteed yet didnt appear greasy. 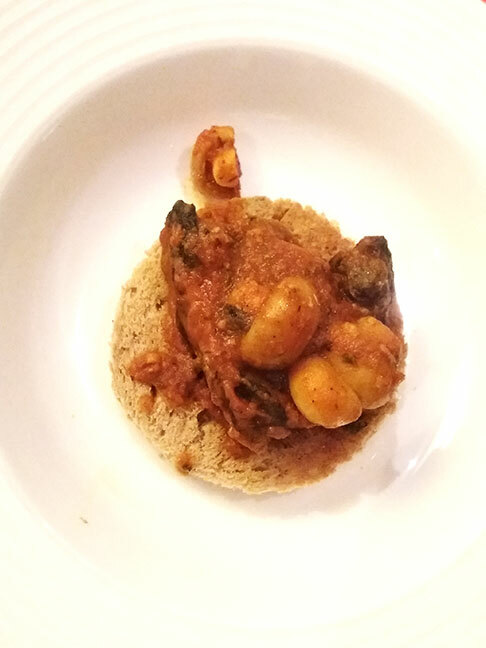 The chewy, salty texture of the mushrooms and snails was well balanced with the soft yet slightly crunchy toasted rye bread. The flavors were subtle which served well with the already earthy yet salty sea snails. It was a first time trying this dish for my fellow bloggers but after a bit of push they mustered up some courage and took a bite. There were no regrets later. Next up was Liver Pate served with Raspberry Coulis & Melba Toast. Liver pate is cooked liver meat grounded to form a paste. This appetizer is not something everyone can relish due to it's intensity but once you get acquainted with the taste, you will surely enjoy it. The liver pate on it's own is extremely flavorsome with a soft. creamy texture and a powdery after taste. Paired with the melba toast and raspberry coulis the texture and flavor is toned down and more acceptable. Liver pate is actually meant to be a spread and never eaten as a standalone. 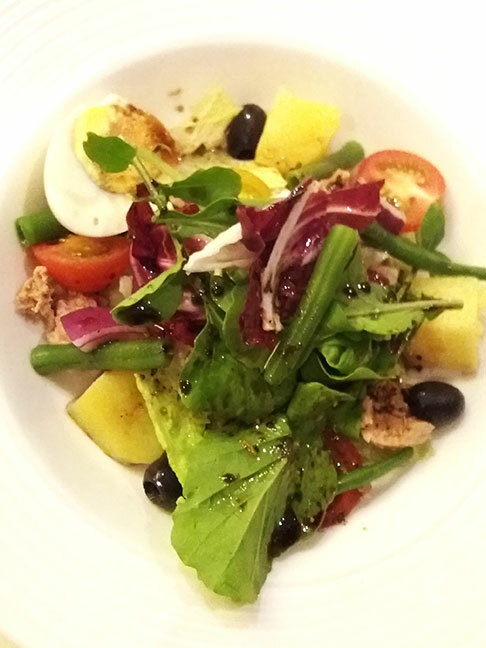 Nicoise Salad, a cheerful, bright salad ideally comprising of tomatoes, tuna, hard-boiled eggs, Niçoise olives, and anchovies, dressed with a vinaigrette, served on a bed of lettuce. Fresh and crunchy with just the right amount of dressing, I do feel the amount of tuna could me increased for more flavor. The Soups that followed the appetizers were an instant hit. The hot Prawn & Lobster Bisque was rich in flavor and had a very creamy texture. It was salty, but not due to added salt but from the saltiness of the shells of the lobster, therefore enhancing the quality of the bisque. This soup is ideal for cold Karachi evenings (which are rare), the amount of warmth it provides the body and soul is truly comforting. This soup is tedious and takes long to produce but the end result is always satisfying. The classic Vichyssoise Soup is served cold and I couldn't think of indulging in anything better in these humid warm evenings. I was so impressed by this delightful concoction that I am definitely planning to recreate it in the near future. Vichyssoise is a thick soup made of puréed leeks, onions, potatoes, cream, and chicken stock. It's ideally served cold but can also be eaten hot, no restrictions there. Even though it is quite rich in consistency and content it is rather refreshing when consumed. The soup is creamy but also has a subtle grittiness which adds to the flavor and experience. There were three main courses but truth be told the Duck was a winner in every way. Beef Sirloin with Mustard Sauce and Lamb Rack "A La Provencale" were both cooked to the bone, the meat was not dry and maintained it's flavor. However, both had more fat than I would appreciate. My brother will surely devour these in no time. 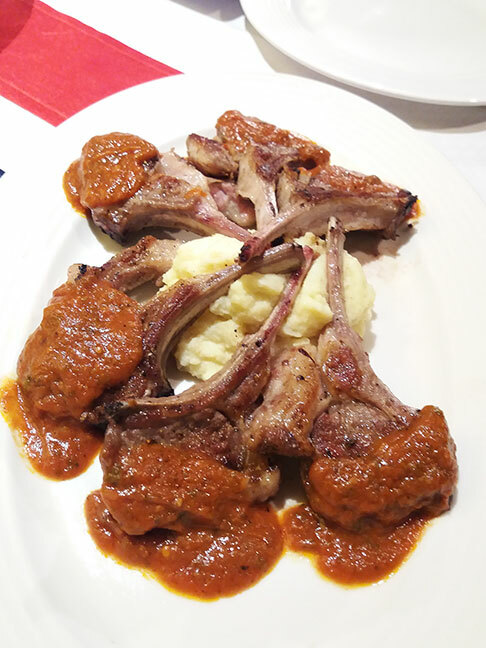 The tomato sauce on the lamb racks was definitely a treat for the palate as it was bursting with flavors, full of herbs and grilled cherry tomatoes. The Roasted Duck Breast with Honey was the showstopper of the evening. 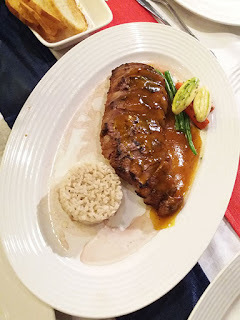 The duck was juicy and chewy yet not overdone, the honey infused with spices and herbs was not overwhelming. I could taste a bit of thyme and ginger. Sweet and savory well balanced. Another one on my list to recreate, now I just need to find a good duck! I don't have much of a sweet tooth. I don't despise sweets and desserts, I just need to be in the mood for some. I was satiated, but when I saw the desserts served in front of us it called out to me, a bit was necessary. 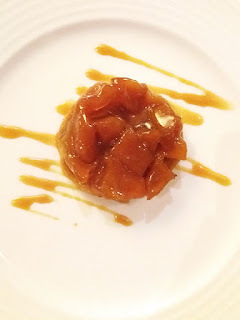 Apple Tatin is actually an upside down pastry. The apples were caramelised before being added to the pastry to bake, or should I say the pastry is added afterwards on the top before it's baked. It's a classic French dessert. The apples were soft and buttery but held their form and texture with a subtle bitter orange after taste, probably due to the orange zest. The tangy apples with the savoury light pastry are delightfully fruitful and mouthful. 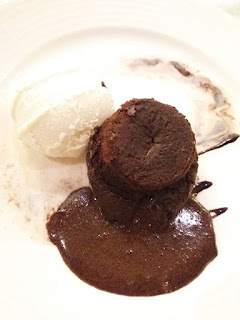 Chocolate Fondant is every chocolate lovers dream come true. This pudding is so soft and gooey it will make your heart melt. The sweetness is not overwhelming which I appreciated. Sometimes when desserts are dominated too much by one element or flavor, in this case too much chocolate, it lacks definition and depth. This fondant, however, has a lightness in it's pudding which is complimented with the thick chocolate sauce and scoop of ice cream served on the side. My overall experience was definitely memorable and I look forward to another night out at ASIA LIVE. I do recommend you go and try out what calls out to you. Be adventurous and do try the duck and escargots if you dare.